When the Phillies started trading on July 31st, all of our goals for 2012 were pretty much re-set. Get out of last, try to get to .500, hopefully get to third place, get the guys who were hurt going good, and develop the young guys. They've actually done pretty well at these. The Phillies are 59-67, so not .500 yet, but they aren't just out of last, they're up to third, two games up on the Mets for that spot. The pitching has returned to form, with Halladay and Lee looking more like themselves lately, Kendrick pitching out of his mind, and Hamels continuing a strong season. While Howard (.257) and Utley (.251) don't have amazing averages, they both have 8 homers, and 25 and 24 RBI's respectively, in 144 and 171 AB's. Their power numbers are good. 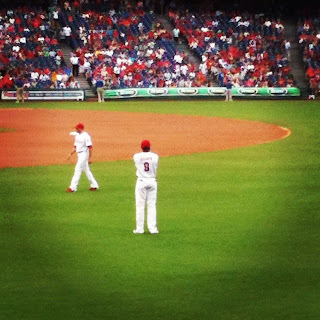 The most important part though has been the performance of Dom Brown. He's off to a .273 start so far this season, with a .733 OPS. In 98 PA's, he's got 9 walks, a solid performance so far. His plate discipline, and overall quality of offensive play has been good. While he's made a defensive blunder or two, his defense has definitely improved. Basically he's coming along well. This takes us down to the pharm, where there is a lot of development now happening. The IronPigs are a half game up for the Wild Card in the International League, at 72-63, with nine games remaining, including the next six against the division leader Yankees. Jon Pettibone is amazing here, going 4-0 with a 1.69 ERA in five starts and 32 innings so far, striking out 23 with a 1.06 WHIP. He's 13-7 with a 2.95 ERA overall. Tyler Cloyd is 12-1 (15-1 overall) with a 2.35 ERA, throwing 142 innings so far, K'ing 93, and posting a 1.01 WHIP this season for the Pigs. Cesar Hernandez and Sebastian Valle are hitting .241 a piece in AAA so far, which while not impressive, means they aren't being overmatched. Reading is also currently in playoff position, at 70-62, they are two games up for the second spot. Darin Ruf is purely amazing. He belted his 34th homer last night, with 93 RBI's, a .313 average, and a 1.013 OPS this season, he's close to the triple crown. He's a first baseman, but has tried some left, and the Phillies would be smart to let him try some more left this fall, either in Arizona or the instructional levels, as this guy has hit everywhere. Tyson Gillies, off of his suspension, is hitting .306 now, with a .827 OPS. Third baseman Cody Asche is turning some heads, hitting .295 so far in Reading, with 10 homers in 224 AB's, for an .869 OPS. Leandro Castro has put up a solid .284 average this year as well. Tommy Joseph did struggle a little early, but is beginning to turn it around since the trade. While Trevor May and Julio Rodriguez have been up and down, and Brody Colvin has struggled, Adam Morgan is 3-0 with a 3.00 ERA in three starts since his call-up. Kyle Simon (Jim Thome deal) is 1-0, with a 2.12 ERA, and a save. Since being obtained for Victorino, Ethan Martin is 4-0 in five starts, with a 2.48 ERA and 24 K's in 29 IP's. Clearwater is the only one of the three A ball clubs with a shot at the playoffs, sitting one game out right now. Anthony Hewitt hasn't hit for any kind of average (.242), but he's smacked 13 homers, and All-Star catcher Cameron Rupp has 10 with his .265 average. Jesse Biddle and Austin Wright have both thrown 136.2 innings, are 10-5 and 10-4 respectively, and have 3.10 and 3.42 ERA's respectively. Biddle, maybe the best arm we have, has 146 K's, to the 125 of Wright. Seth Rosin (Pence deal) is 0-1, with a 3.00 ERA in three starts so far. Lakewood's Kelly Dugan is raising eyebrows with his .295 average, 12 homers, 56 RBI's, .858 OPS, and .383 OBP. 2011 top picks Larry Greene and Roman Quinn are doing well in Williamsport, with Greene at .260, a .723 OPS, and 19 extra base hits, and Quinn hitting .284, a .772 OPS, 27 SB's, and 9 triples in 218 AB's. Down on the pharm, things are going decently, with the talent they picked up doing very well so far. The Phillies would do be quite happy to meet the big league goals above, I think, and come away feeling good about their system after this season is over. With the money they have available, and that kind of finish, you would have to feel like they'll get back to winning in 2013. Thereafter wanting to buy a vehicle could only mean hassles and hurdles inside deficiency of a specialist super real these loans will likely be given towards the bad credit holders despite their a bad credit score tag, because here lenders are just focusing on their present financial position and repayment capability. There are certainly not many secondary school graduates inside the enviable position to be able to pay for for education costs outright paramore concert dates after the international a disaster, numerous financial organizations like banks and also other creditors stop providing out loans simultaneously.